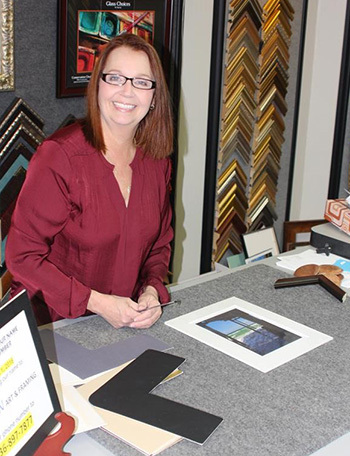 Family owned, we take pride in crafting frames that showcase your most treasured art and mementos. We treat your items with utmost care; your favorite family photos, the painting you found at a garage sale, your sports jerseys, needlework and textiles, the print you bought on vacation, or the original piece of art you bought from a young artist you discovered. We also offer photo and document restoration. Why not showcase these wonderful treasures in a frame or shadowbox that perfectly complements what you love? Decorating your home or office with personal art tells a story much more interesting than decorator prints from a big box store. We pay as much attention to what goes around your art as you do in selecting it. Every frame is unique and specifically appropriate to its contents, just as the artwork you have chosen is a reflection of you and your sensibilities. We only use conservation quality materials. If it's important enough to frame, it's important enough to frame it right. Your favorite photograph of the kids. The painting you found in the corner at an estate sale. The print you bought on vacation last year. The original piece you invested in from a young artist you discovered on a business trip. If you love it, then we love it, and will treat it with the same loving care you would. When it’s important enough to keep it and display it, it’s important enough to trust a craftsman to use the right materials, years of experience, and a little bit of love to give you just what you’re looking for. 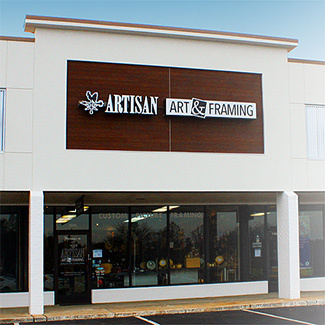 That’s what we do at Artisan Art & Framing: We make the art around your art. We now offer Giclée Printing. Refer to our Products and Services page for more details.